Finding old Toyotas anywhere except on the West Coast can be a challenge.That’s where most were sold, and most older Japanese vehicles, like many European (and a good number of American) cars back then were not properly rust proofed, and thus very vulnerable to corrosion. 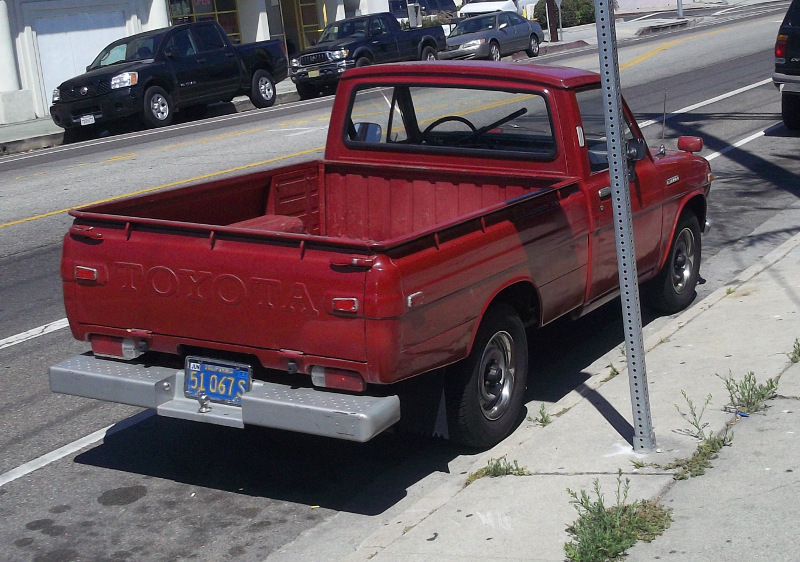 However, older Toyotas remain on the road in LA, such as this first generation Toyota Hilux, built from 1968-’72. 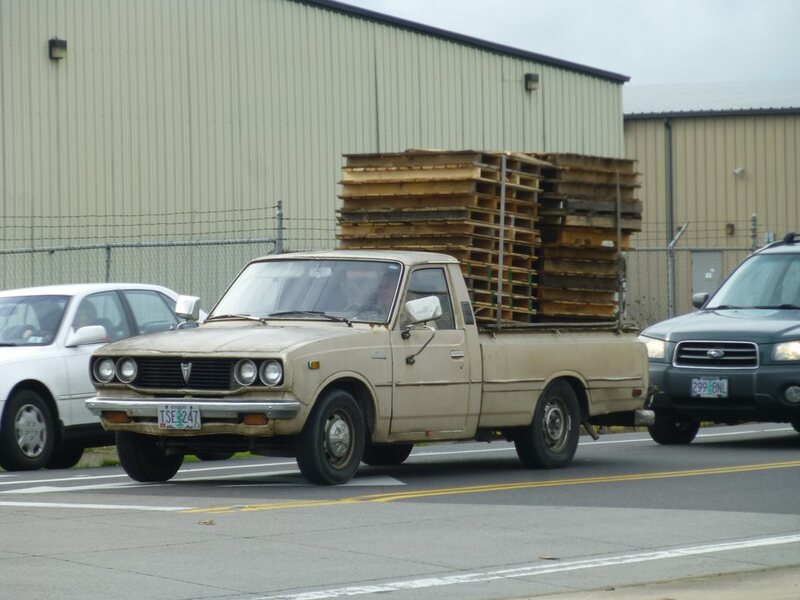 This example is probably an 1971 or ’72, since the lower grille has a finer texture (more bars) than early trucks. To my eyes, this truck looks completely original, with the exception of the wheels. While they appear to be factory Toyota steel wheels, they are from a newer model with a bit more style than the original steelies. This side view shows the successful mini pickup formula as used by Toyota (and Nissan). It’s essentially the same as American pickups, on a smaller scale: RWD, body on frame design, with a manual transmission, coil spring independent front suspension, and leaf spring live axle out back. 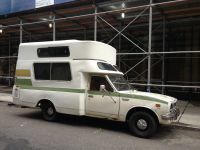 This first generation truck only came in this configuration, with automatic transmissions, longer beds, and four wheel drive waiting to appear in later iterations. This simple formula provided Toyota (and other Japanese manufacturers) with a basic building block, and the foundation for future success. In fact, these small pickups proved so successful that US manufacturers responded almost immediately. First offering captive import models with domestic nameplates, Ford and GM both offered own home built versions in the early eighties. 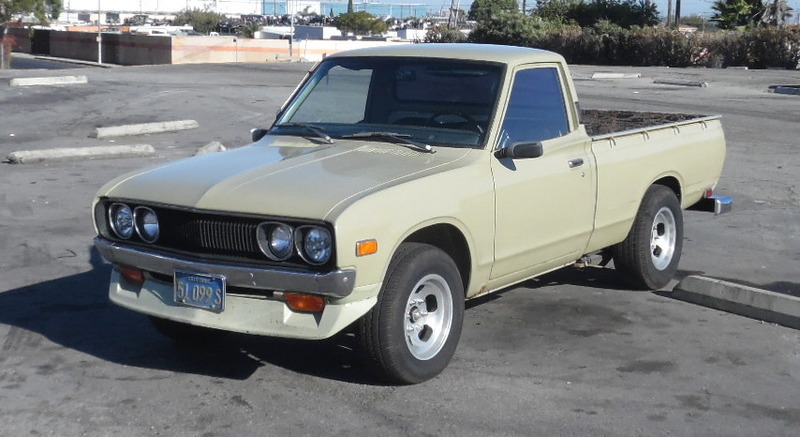 As it happens, I also had a Datsun Pickup in my files, so here’s an example you can use to compare and contrast with the Toyota. Back in the day I found the Datsun’s cab a bit more attractive, and in the early seventies Datsun seemed to have a bigger presence on the street. That advantage faded into the eighties, and in recent years Toyota has dominated the small pickup market (assuming the current Tacoma is in fact a “small” pickup). Although it was the first generation Toyota Hilux, it was loosely based on the Hino Briska, which dated back to 1961, and used a modified version of the 893 cc Hino Contessa engine, derived from the Renault 4CV. After Hino joined the Toyota group in 1967, the Briska was renamed Toyota Briska, since Hino would henceforth specialize only on larger trucks. 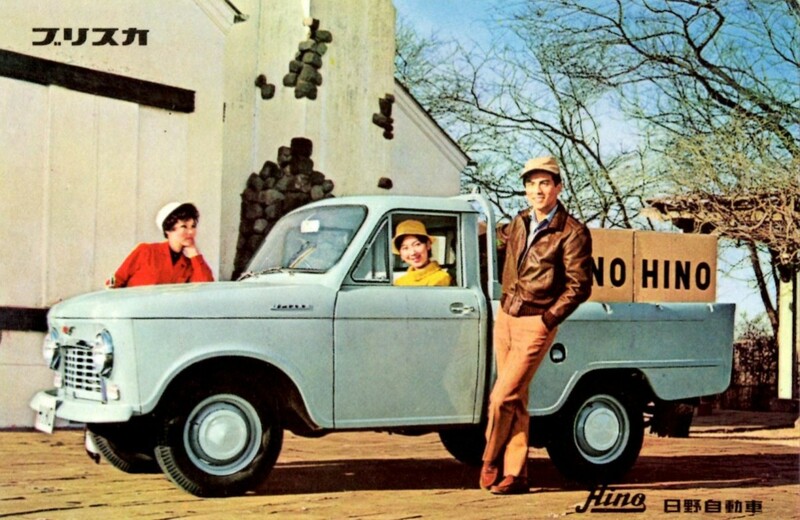 But this first generation Hilux was still engineered and assembled by Hino. The Hilux slotted in below Toyota’s larger Stout pickup (above), which Toyota had been building in various versions since 1954. A version of the Stout was sold in the US between 1964 and 1969. But Toyota decided that the mini pickup market had more potential, although the Stout is closer to the size that the Hilux eventually grew to be. 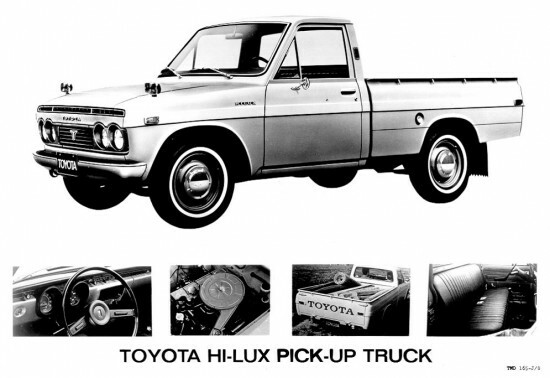 Since the Hilux (or “Hi-Lux”) was first sold in the US in 1969, for that year only one could buy either the Stout or Hilux in the US. This ad shows how the original wheels and hub caps would have looked. If “Hilux” was meant to suggests “High luxury”, then hopefully it was done tongue-in-cheek, as there was nothing luxurious about these spartan and rugged work trucks. 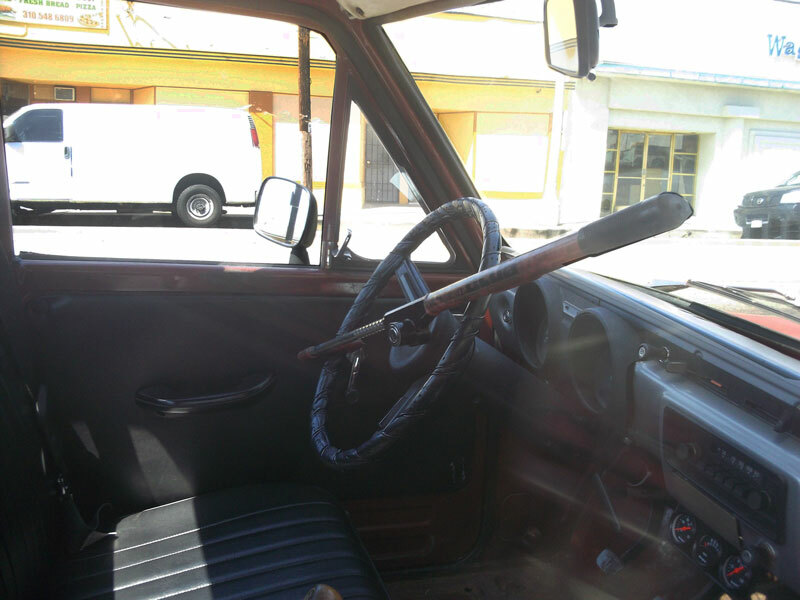 Some versions of the Hilux offered a column shifter for their four speed manual, but most likely didn’t make their way into the US market. presumably it was offered in Japan to make more room for a third passenger, something that was not envisioned in the US, although back in the day three young kids could be seen squeezed into one. This example uses a floor shifted transmission (barely visible at the bottom of the picture), and includes a set of aftermarket gauges mounted below the dashboard. This was also the only generation with vent windows, as Toyota followed the lead of American manufacturers, and went with one piece side glass in 1973. In other markets, the Hilux offered a 1.5 liter OHV R series engine (the 2R). 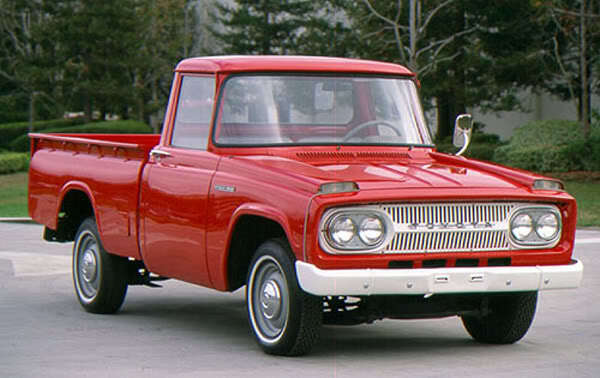 The Hilux arrived in the US for the 1969 model year, and with the same 1.9 L 3R ohv four as used in the Corona. In 1970 the Hilux received the all-new SOHC 8R engine, which in 1972 received a larger bore, creating the 2.0 liter 18R. Those clunky looking turn signals were only used in the US market. Other countries used the eyebrow lights shown in the inset image. I’m not sure why Toyota went with the free standing lights, but I suspect they were a quick and dirty fix designed to meet new 1968 US lighting standards. Those eyebrow signals probably only held a turn bulb function, and either the lens size was too small to meet regulations, or the bulb assembly could not accept a two filament bulb that complied with the regulations. The US turn signal assembly appears to be match the units used on the Land Cruiser, so Toyota may have killed two regulatory birds with one part. 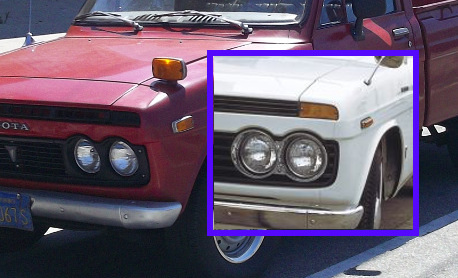 Well, no matter; Toyota tucked the front running light/turn signal assembly under the front bumper on their second generation Hilux, as shown in this one. Since the ’72 first gen Hilux has already received the 2.0 liter 18R motor, this new truck shared most mechanical features with our featured truck. However, the sheet metal and cab both received an update, and the tail lights moved alongside the tailgate, mimicking the domestic pickups. After all, building on an existing structure is the definition of a building block, and over time Toyota has proven they have mastered this approach. I hadn’t seen a first gen Hilux until yesterday, and now this more in-depth coverage fills in the gaps. At a glance, I can’t help thinking of the Isuzu ute, although that face is unique. So are those turning lamps mounted like JDM mirrors. I still think the Datsun was a better looking alternative. Fantastic find and great piece! Thanks Dave. The red Stout Pickup has a resemblance to an International Harvester. The Stout wasn’t available in Canada and I’d never even heard of them until now. Wonder if at the time the compact trucks expanded the market or cost unit sales of the bigger trucks. Responding with captive imports indicates that the domestics thought the market would expand. Given the different development teams, but similar proprietary building blocks, the early Luvs must have looked pretty close mechanicaly. This was probably true of all the small early 70s pickups. If Toyota was still starting off with other people’s engines, that must have been the case with Isuzu. John, Isuzu licenced Rootes Group technology – specifically the Hillman Minx – after the war. You’re going to find that during this time most of the larger Japanese manufacturers used ‘other people’s engines’ apart from Honda and Mitsubishi (although I could be wrong). Toyota – Chevrolet, Nissan – Austin, Hino – Renault, Mazda – NSU. You seem to have a problem with this. The Western manufacturers had no problem with this, in fact they welcomed the extra income. What they failed to take seriously is the fact that the Japanese in most cases were able to take the information transfer and BUILD upon it, whether directly or obliquely. It’s called progress. I don’t think the Chevy Luv used a Minx based engine. I think it was related to the Opel based Chevette engine. Being Opel, the GM building blocks worked with were licensed and authorized. What I definitely find disturbing is using these proprietary building blocks, building upon it, and not paying royalties which definitely seems the case with the Toyota R engine, and perhaps the Toyoglide. They then go to the originators home market, and package them in a way not possible because of American cost structures. This seems to me fundamentally wrong. It is ok with me if others don’t agree. When VW came to the US market, their air and water cooled offerings were proprietary. When Hyundai came, they made no bones that their mechanicals were Mitsubishi licensced. Toyota seems a different case. Proprietary as you are using it here is a legal concept. Royalties are paid between two parties that agree that they are owed. If there is an aggrieved party that feels their intellectual property was stolen and royalties or damages are owed, they can pursue the thief in the courts. I don’t recall the powerful and politically connected GM of 1966 filing any suits against Toyota. The facts of the situation seem to be that Toyota built Chevy 6s under license before WW II, and eventually produced 4 Cylinder engines that had some similarities in design to what had become an old engine. Toyota either had certain rights with GM to do this, or the design was sufficiently different that GM had no claim. When you get down to it, all developments on internal combustion engines build on the past designs of many engineers and companies. Toyota in recent years has had leadership in hybrid cars. GM and others have also built hybrids using very similar concepts. I believe Toyota has licensed some hybrid technology to other companies, but I don’t believe GM is one of them. The LUV used a 1.8 liter version of Isuzu’s first self-developed engine, the G series. As for the Chevette, GM did not use Opel based engines. GM bought the rights to produce 1.4 and 1.6 liter variations of the G-series Isuzu engine, and manufactured them in Flint, MI for North American T-cars. I muffed it by twice passing up Stouts at reasonable prices , rust free here in California . The pallet filled Hi-Lux pictured here is still a fairly common sight in Central Los Angeles although most are getting pretty battered by their indifferent owners . Stouts…they must not have sold many, I don’t recall seeing any compared with the Hi Luxes, and the Chevy LUVs and Ford Couriers back in the 70s. I don’t know that the owners are indifferent — if they were, the trucks wouldn’t still be running, in all likelihood. But a surprising number of those trucks are still obviously used as working vehicles, not collector toys. Hauling contracting supplies and auto parts around this city is a good way to accumulate all manner of dents and scrapes, and there’s not much reason to spend money touching them up if you know you’re just going to accumulate more. I’m a Blue Collar guy who’s always had a Pickup Truck and all were elderly , none were ever allowed to be filthy in spite of hard work most days , hauling cores and used Auto Parts , it’s a simple thing to clean your tools weekly at the very least . Too lazy to clean the glass ? that means you’re indifferent , not too bsy . I wonder if the manual column shift was offered in any LHD markets, and how long it lasted in RHD. Certainly on the car side with the Corona Toyota had learned that Americans considered a four-on-the-floor a “plus” feature and those who didn’t want one generally bought automatics; with the former being expected in Europe, it wasn’t worth it to do an LHD manual column shift at all even though the RHD one lasted well into the ’70s and Isuzu at least continued offering manual column shift in Australia and the UK into their ’81-87 trucks. I repainted a 93 Nissan flat deck a couple of years ago it was NA diesel with column shift five speed. Reading CC I’ve come to understand the Hi-Lux is revered around the world, and the name is still used in many markets. In the central U.S., I didn’t realize the Hi-Lux was ever sold in the States. When was the last year the Hi-Lux name was use in the U.S.? “Hilux” last appeared on the badging of US-sold trucks in either 1971 or 1972. After that, it was officially called “Toyota Pickup”, until the Tacoma came along and replaced it. But the early generation or two of the Tacoma was still essentially the same as the Hilux sold in other parts of the world. Only the last generation Tacoma was specifically designed for the US, and somewhat larger. I’ve seen a 2nd generation Hilux camper driving around the city here with “HILUX” badges… although I suppose they could’ve been added later. Never been able to capture a shot of it, but the internet is already one step ahead of me as usual (photo stolen from Alex Nunez on Flickr). I probably got the last year wrong. But it was during the second generation that the Hilux name was dropped. Adam below says it was 1976. That may well be right. I do know that the last few years of the second generation didn’t have it anymore. Nice find Dave. Had something like this in my family. My BIL was a WW2 vet who generally despised all things Japanese. 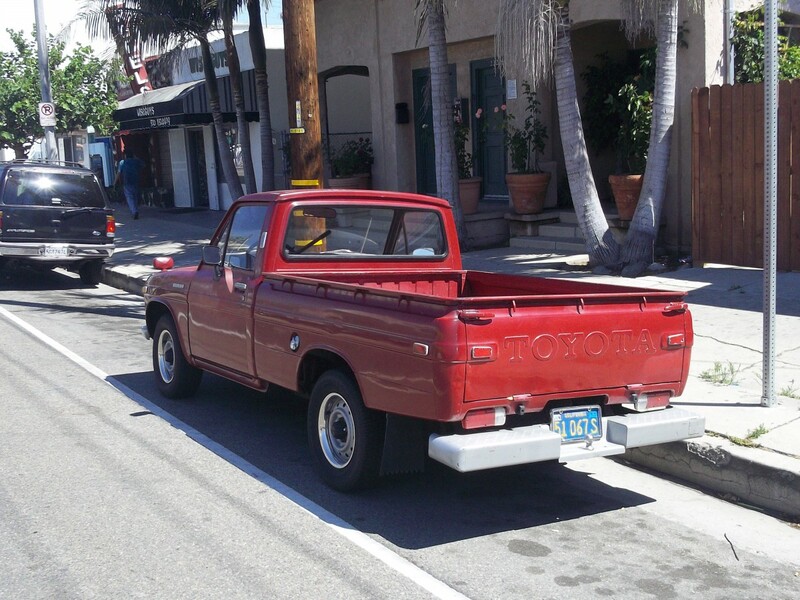 Then he bought a Toyota pickup in the early sixties. Looked like the picture of the Stout but things are hazy. Column shifter for a 4 speed. Still hated Mitsubishi but had a long string of Toyota and Subaru before he died. The truck rusted away after more than 200k miles and he made a trailer out of the bed. It’s probably still being pulled around the Dodge City area by someone. I had a 620 Datsun king cab and thought it was great. Much stronger head gaskets than the NAPSZ engines that followed. I paid $200 for it and proceeded to beat the crap out of it for several years. I let it go because it had just become too ugly but the engine still ran like a top. Should have stripped it and made a trike. Oh well. This is true, Toyota seems to rule the roost on midsize trucks which must be a small consolation for them as they still cannot seem to make a full size truck that even attempts to compete in the US market. I have always liked the first generation Toyota Taco. 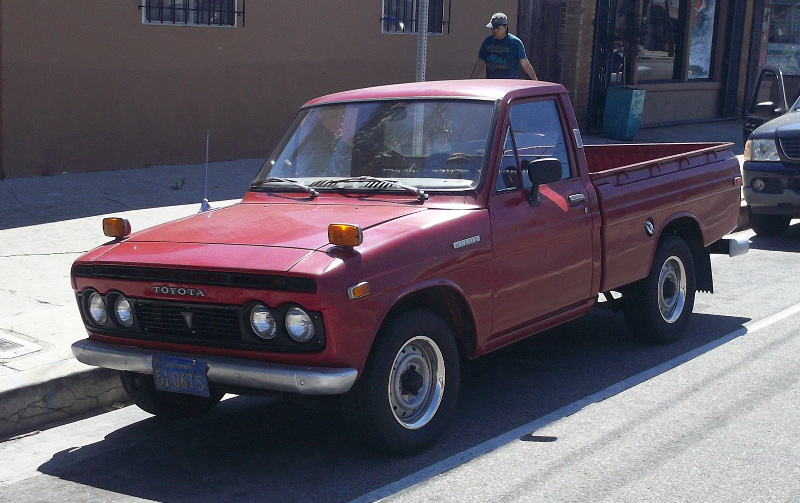 California or Oregon, Washington State, Arizona, New Mexico may be the only places left where it is possible to find an early 70’s example of a small Japanese truck. Everywhere else, they turned to iron oxide quite rapidly. Aftermarket rustproofing would help, but it would just postpone the inevitable. 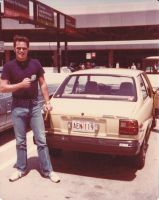 My first brand new car was a 1980 Toyota Tercel bought new in Hawaii. I ordered the dealer-applied (gooey, sticky) Quaker State rustproofing. The dealer (Service Motor) forgot to remove the tire changing tool bag when the coated the inner quarter panels with goo. 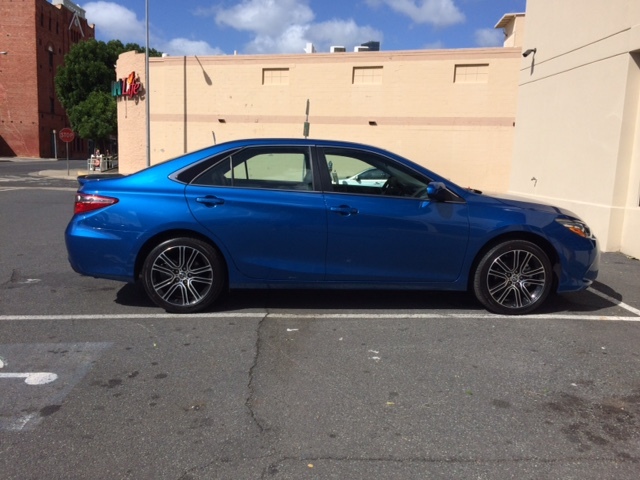 Coincidentally, two weeks ago, I purchase from Service Motor in Waipahu a new ’16 Camry SE Special Edition. 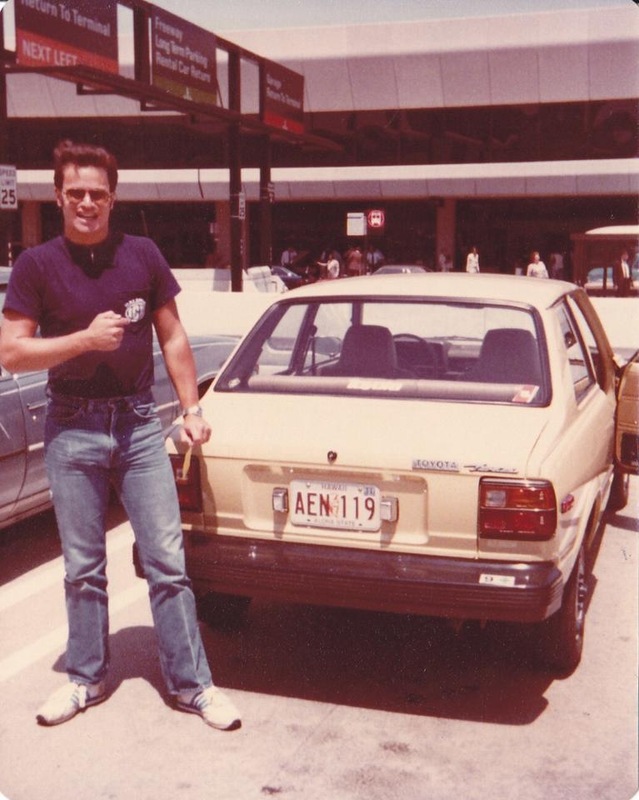 Here’s the ’80 Tercel (shown back in ’81 in Honolulu). My folks had a 1980 2 door Tercel also it was bought new. It was silver with a black interior, black vinyl seats, no AC and a 4 speed manual trans and black rubberized bumpers that were huge My dad used it as a commuter car. Summers in Maryland were not kind to the occupants of a car like that(I once hopped into the car without checking the temp of the seats and burned my legs good. Not exactly. There are several second-generation Hilux/Tacoma to be found around Richmond, VA. Maybe they all got rustproofed early in their life, and a couple of them do still have significant rust-through in the bed sides, but they’re still on the road. I’ve also seen precisely two Datsun 520’s in recent years. I will agree that they’re rare, but they’re not extinct everywhere else yet. Your car may have Hawaii plates, but the background location was and is San Francisco International Airport, across from the United Airlines terminal. Here’s the new ’16 Toyota Camry SE Special Edition . . . . you can’t go wrong with a Toyota . . . . 2.5 four banger. It’s kind of amazing how many kids you can stuff into the cab of a narrow truck. One of my earliest memories is of my Mom running through the crashbox four-speed of a ’46 Chevy 3/4 ton and still being able to whack my two brothers and I on the head between shifts. I suspect the cabs were about the same width, though the Toyota lacked the vertical dimensions and so was impossible for a full-sized American body. I like that Datsun on slot mags. A bit too dinky for my frame, but they sure did look scrappy and stylish. “Those clunky looking turn signals were only used in the US market” – also the Canadian market; they were very common in Vancouver when I was young. I remember seeing the first gen Toyota Hilux, with the “clunky looking turn signals.” I actually found them quite attractive, and since they were mounted high up, where pedestrians can see them, I would think it’d be safer than having them mounted below the bumper, where they’d be difficult, if not impossible, to see them. Ma Bell. Had to have my own vehicle no company ride in my job. I really do not remember if it was a 69 or 70. Yellow. Why did I choose the HiLux? Bigger engine and bigger brakes. Thats it. Pretty sure my Dad’s 1980 pickup had vent windows. You could get vent windows as late as ’87 in some models. I’ve got an ’88 which I bought new. Not available in ’88. Early Honda Civics used the identical same turn signals, mounted on top of the front bumper like driving lights. The Plymouth Arrow (Mitsu Celeste) had them there too, but with clear-white instead of amber lenses; both cars got better-integrated blinkers with their midcycle facelifts. Those clunky looking turn signals were only used in the US market. Other countries used the eyebrow lights shown in the inset image. I’m not sure why Toyota went with the free standing lights, but I suspect they were a quick and dirty fix designed to meet new 1968 US lighting standards. Those eyebrow signals probably only held a turn bulb function, and either the lens size was too small to meet regulations, or the bulb assembly could not accept a two filament bulb that complied with the regulations. Not a bulb issue; the single-filament bulb in common use at that time had a same-size, same-shape dual-filament equivalent that would have needed only an easy (and very common) socket swap to fit and work in the eyebrow light. Probably not a size area, either; the front turn signal minimum lit area requirement is (and was at that time) 3.4 square inches (22 cm2). That’s a lot smaller than it sounds. The issue was probably output: turn signals with lit edge located within 4″ of the nearest lit edge of the low beam headlamp have 2.5× the minimum intensity requirement of turn signals spaced further away from the low beam—at least 500 candela on axis rather than at least 200. It would be very difficult for a turn signal the size and shape of that eyebrow to provide 500 candela on axis with the available bulbs. The separate signals, larger and further away from the headlamp, could technically give higher intensity and legally meet an easier requirement. But they’re ugly as sin; they make the ones on the Volvo 164 look like the first thing its designers considered.